The hand is an amazing construct of 27 bones and 33 joints that allow for subtle touch discrimination, fine articulation and dexterity, as well as the gross motor patterns of grasp, release and weight bearing. The proximal component of the hand is formed of eight carpal bones arranged in two rows like bracelets forming the wrist while the distal portion of the hand is composed of five long metacarpal bones and fourteen phalanges. The palm of the hand forms a doming structure. It can be thought of in two ways. Most generally, as one roots the circumference of the hand into the earth there is a natural rebound up through the central dome of the hand. More specifically, you can think of the hand as having four points, like the foot, that root into the earth allowing the lift of its four arches. The four points include the pisiform (or lateral wrist), the trapezium (or medial wrist), the root of the first finger, and the root of the little finger. The arches run between them: the carpal tunnel or proximal transverse arch, the distal transverse arch at the root of the fingers, medial longitudinal arch which includes the thumb and thenar eminence, and the lateral transverse arch. In yoga, we want the hands to be soft and energized, receptive and alert. This is especially true in non-weight bearing poses where the arms are reaching into space. You want the hands to softly spread and yield into space. Let the hands be equally long on the front and back sides allowing energy to travel the bones from the center of the shoulder socket along the bones of the arms, flow over the bones of the wrist and along the long bones of the fingers. Imagine enough space between the carpal bones of the wrist that a warm breeze could flow between them. In weight bearing, the hands yield into the ground spreading the body’s forces into the earth and receiving the earth’s rebound back up through the hands into the bones of the arms. Placement of the hands is very important. They are usually placed under or slightly forward of the shoulders. The crease of the wrists form a crescent moon shape that should be parallel to the mat to assure that weight is falling equally through the inside and the outside of the wrist. The knuckles of the hands need to root toward the ground so that the body’s weight does not collapse into the carpal tunnel of the wrist. Begin to practice balancing the inside and outside of the hand and notice how the forces travel up the arm into the shoulders and the chest. 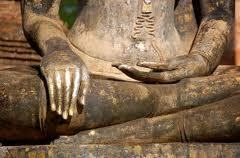 There are many poses in which the hands come together in namaskar. Allow the hands to yield into one another and balance the press through all fingers. Feel how this engages different parts of the shoulders and the chest and gives one the sense of midline in the body. To feel this in practice, try using namaskar to assist your sense of the central midline in tree pose and warrior three.